Gas Water Heaters from Stafford Mechanical Services, Inc.
Do you need a new gas water heater for your home? Then choose Stafford Mechanical Services, Inc. to help. We offer reliable, durable gas water heaters that have been built with energy efficiency in mind. 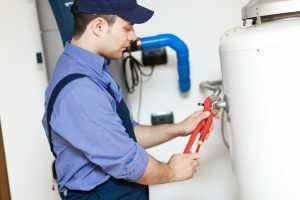 And, when you work with us for your gas water heater installation, our skilled technicians will provide you with expert, professional service. We are proud of the quality gas water heaters we provide our customers, chosen for their traditional styling and the consistent hot water they provide. You’ll have reliably heated hot water all throughout your home, when you choose a gas water heater from Stafford Mechanical Services, Inc.
Stafford is pleased to provide gas water heaters for your home. When you need a gas water heater for your home, trust the professionals at Stafford Mechanical Services, Inc. to help you. You may contact us via phone at (860) 684-9485. We look forward to helping you with your water heater needs. Ready for a quote or need more information? Give us a call at (860) 684-9485 or complete the form below and a rep will reach out to you. Thank you for considering Stafford Mechanical Services!